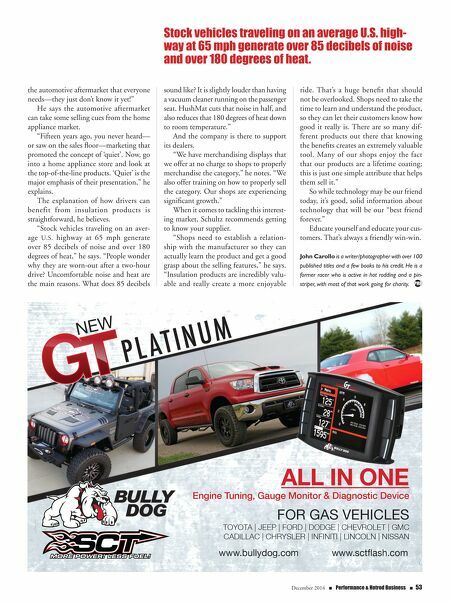 December 2014 n Performance & Hotrod Business n 53 the automotive aftermarket that everyone needs—they just don't know it yet!" He says the automotive aftermarket can take some selling cues from the home appliance market. "Fifteen years ago, you never heard— or saw on the sales floor—marketing that promoted the concept of 'quiet'. Now, go into a home appliance store and look at the top-of-the-line products. 'Quiet' is the major emphasis of their presentation," he explains. The explanation of how drivers can benefit from insulation products is straightforward, he believes. "Stock vehicles traveling on an aver- age U.S. highway at 65 mph generate over 85 decibels of noise and over 180 degrees of heat," he says. "People wonder why they are worn-out after a two-hour drive? Uncomfortable noise and heat are the main reasons. What does 85 decibels sound like? It is slightly louder than having a vacuum cleaner running on the passenger seat. HushMat cuts that noise in half, and also reduces that 180 degrees of heat down to room temperature." And the company is there to support its dealers. "We have merchandising displays that we offer at no charge to shops to properly merchandise the category," he notes. "We also offer training on how to properly sell the category. Our shops are experiencing significant growth." When it comes to tackling this interest- ing market, Schultz recommends getting to know your supplier. "Shops need to establish a relation- ship with the manufacturer so they can actually learn the product and get a good grasp about the selling features," he says. 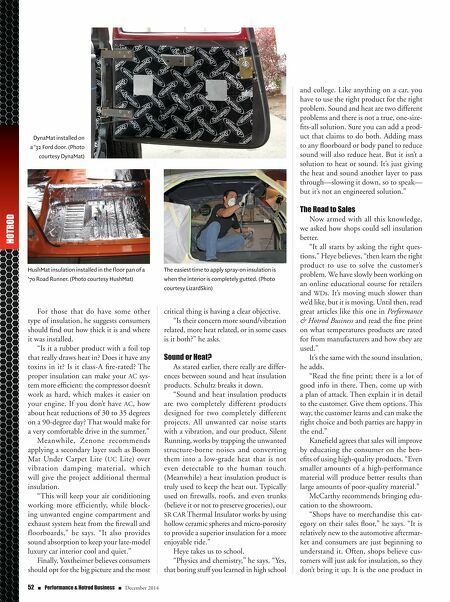 "Insulation products are incredibly valu- able and really create a more enjoyable ride. That's a huge benefit that should not be overlooked. Shops need to take the time to learn and understand the product, so they can let their customers know how good it really is. There are so many dif- ferent products out there that knowing the benefits creates an extremely valuable tool. Many of our shops enjoy the fact that our products are a lifetime coating; this is just one simple attribute that helps them sell it." So while technology may be our friend today, it's good, solid information about technology that will be our "best friend forever." Educate yourself and educate your cus- tomers. That's always a friendly win-win. John Carollo is a writer/photographer with over 100 published titles and a few books to his credit. He is a former racer who is active in hot rodding and a pin- striper, with most of that work going for charity. Stock vehicles traveling on an average U.S. high- way at 65 mph generate over 85 decibels of noise and over 180 degrees of heat.